OTTAWA -- Conservative Leader Andrew Scheer says the Ontario government is well within its legal rights to use the Constitution's notwithstanding clause to cut the size of Toronto's city council but would not say whether he thinks it is a good move or whether he would ever use the clause himself. Scheer and the Conservatives have been noticeably quiet on the matter since Ontario Premier Doug Ford on Monday took the unusual step to invoke the clause to allow him to go forward with his plan to cut the size of Toronto's city council in half. Ford's move came after an Ontario judge ruled it was unconstitutional to slash the number of city council seats in the middle of a municipal election without consultation because it interfered with the right to freedom of expression of candidates and voters. On Wednesday Scheer scheduled a news conference in Ottawa to talk about an ethics breach by Liberal cabinet minister Dominic LeBlanc, but was peppered with questions about the constitution as well. The notwithstanding clause gives provincial legislatures and Parliament the ability to usher in legislation that overrides charter provisions, but only for a five-year period. Scheer would not say whether he thinks Ford's decision this week was an appropriate use of the measure, saying it is up to the people of Ontario to make that call, not pundits, academics or politicians from other levels of government. Prime Minister Justin Trudeau said Tuesday he was disappointed in Ford's decision but that he would not block Ford's move. Even so, it appears he would have few, if any, legal options to do anything to stop it. Former prime minister Brian Mulroney said at an event in Ottawa Tuesday that when he was in office he had "no interest in using it, no matter what," and called it one of the flaws in Canada's legal blueprint. Scheer refused to speculate about whether he would use the notwithstanding clause if he forms government. "We're working on our platform right now and we're confident we'll be able to implement the types of proposals that we're working on right now through the normal legislative process," said Scheer. 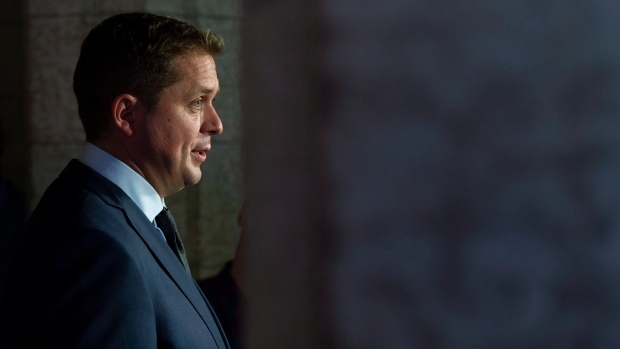 The notwithstanding clause question is one Scheer wants to avoid, said Tim Powers, Conservative strategist and vice-chairman of Summa Strategies. Powers said Ford's decision to use the measure could become a "landmine" for Scheer because it is challenging to have Mulroney and other retired progressive conservatives say the use of the clause is not appropriate while at the same time being cognizant of the fact that he will need to draw from Ford's supporters in 2019. "He wants to get away from this issue as fast as he can," said Powers. Like Scheer, Saskatchewan Premier Scott Moe also refused to comment on the merits of overriding the charter to force through a bill on the size of Toronto's city council but defended the practice in general. "We've used the notwithstanding clause in this province in the not too distant past," Moe said. "The fact of the matter is that it is part of our Constitution ... and it is I would say a necessary part of the Constitution to ensure that the power lies within the people that are elected by the people in this great democracy that we call Canada." Conservative justice critic Tony Clement said Conservatives believe that Parliament and legislatures are the "ultimate" law making bodies. "We also believe in the legitimacy of the entire Charter of Rights and Freedoms, and that includes section 33," said Clement. Saskatchewan MP Brad Trost, who is not running in the next election, praised Ford on Twitter "for standing up for what he believes in and for taking action on behalf of the people who elected him in invoking the notwithstanding clause." With files from Joan Bryden in Saskatoon.